Fur-tastic Holiday Fun at Deck the Paws! 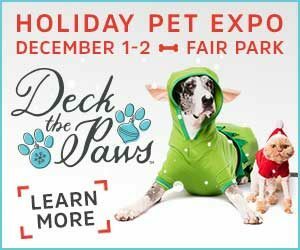 Make your holidays extra merry and bright at Deck the Paws, a two-day pet-topia of fun for the whole family! Promising to be your new fur-vorite holiday tradition, you’ll fa-la-la-la-love the paw-tastic festivities! The spirit of the holiday season is all about giving! Paw-tnering with local, animal-related nonprofits is one of Deck the Paws’ main goals. Produced by Dallas-based Unleashed Paws, LLC, the two-day celebration will help raise money and awareness for local nonprofits Artists for Animals, DFW Pup Patrol, and Operation Kindness. 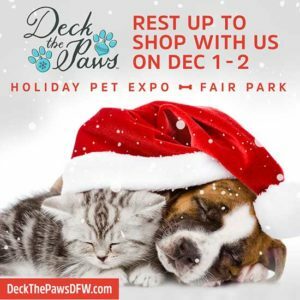 Deck the Paws is December 1-2, 2018 from 11:00 a.m. – 7:00 p.m. at Fair Park’s Centennial Hall (1001 Washington, Dallas, TX 75210). Tickets are currently available at www.DeckThePawsDFW.com. Free admission for Kids 12 and under and Seniors 65 and over. Pets are freer to (must present a signed waiver). Thanks for participating in our giveaway. This contest is now closed. 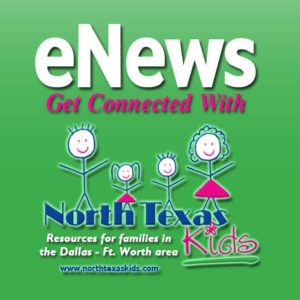 North Texas Kids is giving away 5 family 4-packs of tickets to attend Deck the Paws! That’s FIVE chances to win tickets! One entry per family; 5 prizes = 5 winners! Each prize is 4 general admission tickets to the event on Saturday, December 1st or Sunday, December 2nd. Here’s how you can enter this giveaway: do the actions in items 1 – 3. Get an extra entry with item 4. 1. Sign up for our free newsletter. Already a subscriber? Great, go on to item 2. 2. Click on the following image to visit DeckthePaws.com. Tell us in the comments below which activity you’re looking forward to the most at the pet expo in December. Done? Great, go on to item 3. 3. Like then share this post from the North Texas Kids Facebook page publicly on your timeline. Note, only publicly shared posts count for this giveaway. Please send us a message via our Facebook page so we don’t miss your share! 4. Want an extra entry? Leave a comment on the Facebook post why you’d like to attend Deck the Paws. Be sure to use a valid email address for your newsletter sign up and comment below. Contest ends on Wednesday, December 14 at midnight and winners must respond by Friday, 11/16 or prize will be forfeited. My kids would be excited for the petting zoo but my heart is most excited for goat yoga. Can’t wait for Santa’s village with photo op-paw-tunities with old Saint Nick! Would love for our little King to participate in the Picasso Paws Art Show! I’d love to check out Simba’s Barkery to get some treats for my 3 kids.